If you have a SAN or shared file system it can be used to provide high availability such that if a broker is killed, another broker can take over immediately. Note that the requirements of this failover system are a distributed file system like a SAN for which exclusive file locks work reliably. If you do not have such a thing available then consider using MasterSlave instead which implements something similar but working on commodity hardware using local file systems which ActiveMQ does the replication. GFS: fully supports Cluster-wide flocks and POSIX locks and is supported. In the event of an abnormal NFSv3 client termination (i.e., the ActiveMQ master broker), the NFSv3 server will not timeout the lock that is held by that client. This effectively renders the ActiveMQ data directory inaccessible because the ActiveMQ slave broker can’t acquire the lock and therefore cannot start up. The only solution to this predicament with NFSv3 is to reboot all ActiveMQ instances to reset everything. Use of NFSv4 is another solution because its design includes timeouts for locks. When using NFSv4 and the client holding the lock experiences an abnormal termination, by design, the lock is released after 30 seconds, allowing another client to grab the lock. For more information about this, see this blog entry. 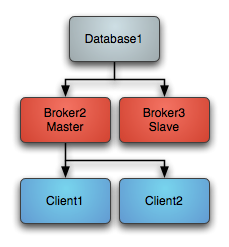 Basically you can run as many brokers as you wish from the same shared file system directory. The first broker to grab the exclusive lock on the file is the master broker. If that broker dies and releases the lock then another broker takes over. The slave brokers sit in a loop trying to grab the lock from the master broker. 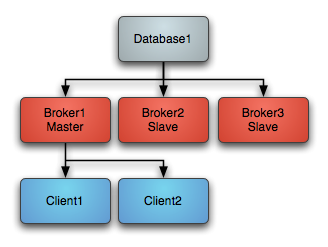 The following example shows how to configure a broker for Shared File System Master Slave where /sharedFileSystem is some directory on a shared file system. It is just a case of configuring a file based store to use a shared directory. 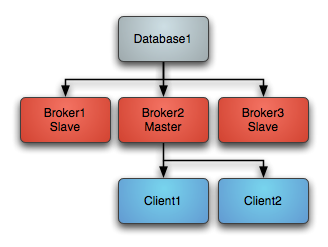 On startup one master grabs an exclusive lock on the broker file directory - all other brokers are slaves and pause waiting for the exclusive lock. One of the other other slaves immediately grabs the exclusive lock on the file system to them commences becoming the master, starting all of its transport connectors.